I was born in Memphis in 1972 and grew up in Whitehaven. I was two years old when my mother and father divorced, and I didn't see my father again until I was 15. So my mother's father and my mother's two brothers served as my male role models. My older brother Donnell and I lived with Mom in a two-bedroom house on South Parkway, right across the street from Coletta's. One bedroom wasn't finished enough to use, so my mother slept on one side of the remaining bedroom, and my brother and I shared a bed on the other side. Mom worked the coat checkroom, as a banquets waitress, room service manager, and cafeteria manager at The Peabody and other hotels, as well as worked administrative jobs through temp agencies when she could find it. There were times when the lights got cut off, and we had to live for weeks at a time with no utilities. We didn't have a telephone. It was in that house that I found out the truth about Santa Claus at the age of seven. I knew we were struggling, but I was hoping that Santa would come through that Christmas. He didn't. I figured out then what was what. But my mother was very well educated, and she was determined to get us into private schools. She sent us to a Catholic school a few blocks away. She struggled to pay the tuition, and sometimes she would work at the school to help make up the shortfall. There were times when she couldn't pay it, and we had to sit out of school for a week or so until she could come up with the money. Thankfully, we were smart kids, so when we returned, we could pick back up and we never got too far behind. It was obvious to my brother and me that we were living a very different quality of life than our classmates. Those years were a real struggle. But it was what it was. But Mom used to take us to Bellevue Park to play. We'd go to community baseball games. We played football and basketball and were part of different children's organizations. We were very exposed culturally. My mother's siblings were actors and actresses in the theater here. My aunt worked at the Brooks Museum — one of the first African-American employees there in the '70s. We were dragged to more plays and cultural events than a child should have to go through! We were also very involved in the Metropolitan Baptist church in South Memphis, which had different youth programs. So although we struggled — there were even times the church had to pay our light bill — we were still exposed to many good things. My grandfather, Samuel Peace Sr., was a very prominent real estate man in the city, so my mother, growing up, was exposed to the Who's Who of black Memphis and did all the high-society things of an upper middle-class lifestyle. After my parents divorced, my mother kept our struggles hidden from her parents for that reason. Finally, our babysitter called my grandparents and told them what was going on, and we moved in with them when I was nine. My grandfather developed Lakeview Gardens subdivision in the '60s and '70s, one of Memphis's first black middle-income communities. His house sat at the corner — the grandest house of the neighborhood. It was 3,500 square feet, had a huge backyard, four bedrooms, an office area — it was a nice house! My grandfather and grandmother had a huge impact on me growing up — and not just after we moved in with them, but all my life. They were like parents in a lot of ways. They did whatever they could to make sure we had a childhood complete with nurturing, love, support, encouragement, and all those things. After we moved in with them, I went to public schools for two years. What an eye-opener! In private schools, we had classmates who were middle and upper middle class. In public school, a lot of the children walked from the two housing projects nearby. Now we were in an environment where more than half of the students were low income. We began to see that there were certain norms and values that weren't always the same as ours. It gave us a window into some of the realities of socio-economic differences, even among young people. We spent so much time in my grandfather's office! He let us answer the phones; he'd take us to the bank with him and let us make bank deposits; he'd take us with him to do appraisals and have us take measurements and help. So we grew up around the real estate business. It's a part of who we are. When it came time for high school, my mother walked into Memphis University School — a college-preparatory school — and told them she wanted her sons to go there. MUS said that if we passed the entrance exams, they would help figure out the financial aid to make it possible. My brother and I both graduated from Memphis University School — me in 1991. Once again, Mom made sure we went to the best schools in the city even though we were probably among the most disadvantaged students going there. I wanted to go to a historically black college, and I applied to several of them. Rhodes wanted me to come play football, but I wanted the black college experience. I got accepted at a few, but I wasn't clear on the financial aid piece of it, and Mom was working so much that she didn't have time to help me. One day right before the semester started, my mom asked, "Have you gotten everything finalized?" I said, "No." She said, "OK, you're going to Rhodes." It's a great institution, and I saw a lot of potential being from Memphis, going to Rhodes, and remaining in Memphis. I worked nights as a cargo handler at the FedEx hub, and I interned for three summers at NBC Bank Downtown. I graduated from Rhodes in 1997 with a degree in anthropology/sociology because those areas really interested me. I went to work at the Chamber of Commerce in 1999, selling memberships, which was a 100 percent commission-only job. That was my first "eat what you kill" experience, and it put some hair on my chest — but it also prepared me. I learned about economic development, capital investment, business growth, and expansion. I saw commercial real estate as a direct beneficiary of all this. I would read about this deal getting signed over here and that deal getting signed over there. I thought, Man, these folks seem to be very busy in commercial real estate. This could be an opportunity to apply what I'm learning with my interest in real estate. I decided to start exploring it. But first I wanted to go ahead and get licensed so that if an opportunity presented itself, I'd be ready to move on it. I got my license in 2000. Through the process, I realized there weren't many people in commercial real estate who looked like me. I thought that could be an advantage and an opportunity to blaze the trail, to create a path for blacks to have an opportunity to be in this business. Ultimately, I went to work for Commercial Advisors LLC in 2001. Everything I know I learned from them. At the time, I was the only African American working for a major commercial real estate company in the city. I decided to branch out on my own in 2007. I wanted to continue my grandfather's real estate legacy. Also, I was <<still>> the only African American in this field — and not because there was anything special about me. Rather, I was the only person given a shot. I knew people who were interested; I knew people who wanted opportunities. After seeing all of these talented people not be given an opportunity, I decided I'd just start my own company and <<I>> would give them the opportunity to get into the business. I opened my business in 2007 with one client. Over the years, we've added to the mix, and now we're doing business with some of the city's major players as the first and only African American–owned commercial real estate firm in Memphis. The main difference between commercial real estate and residential real estate … Commercial real estate is about income-producing properties. It is economic, commerce, business-focused. Residential is about spaces to live in. It's personalities, emotions, and personal preferences. One of the first things I learned in commercial real estate … is all you have is your time, so be judicious about where you invest and apply it. The part of this job that requires the most stamina … are the economic cycles and fluctuations. Our business is based on business growth and expansion, and during the times when that's not taking place, it's challenging. In this field, I most enjoy … the opportunities I've had to take my skills and know-how and help some community-based organizations that have some real estate needs. They may not be lucrative deals, but those things warm my heart more so than doing a major transaction. One of my most difficult assignments … A nonprofit client was trying to acquire a condemned apartment complex so they could make way for a community redevelopment project. For two and a half years, I worked with them without making a dime. We went through three different iterations to find the decision-maker. We had to interface with government on back taxes, get demolition quotes, negotiate relief for penalties on the owner — that project was one of the toughest ones to stick with. The public's biggest misperception about this business … is that it's a large local industry. It's not. It's really quite small in terms of the players/brokers — both in the macro sense and the micro sense. Our extreme poverty growing up was due to … two things, mainly: no child support from my father and my mother's pride in not pushing for that support. I reunited with my father when … I was 15 years old. My brother, who was 17, told Mother, "I want to see Daddy." The two of them knocked on my father's cousin's door just around the corner, and that Thanksgiving, we reunited with him and picked it up from there — although the relationship was not "father and son" in the traditional sense. But we enjoyed 20 more years together until he died in 2008. Attending public schools taught me … toughness. It really did. I used to lie about … When my schoolmates asked what my father did for a living or where he was, I'd tell them he lived out of town and leave it at that. At that time, the standard was that everyone's father was around and involved. Mine wasn't. My greatest extravagance today … Italian loafers. Once I had my first pair, I was hooked. Ferragamo is my favorite. I grew up real fast when … I worked as unit manager at Guardsmark security firm. It was my first job out of college, and I had a hierarchy of 75 guards under my supervision, most of who were my parents' age! I was on call 24/7/365. The responsibility and the leadership required — there was always something happening that needed my attention. It was like being thrown into a pool not knowing how to swim. From my father, I got … ambition and leadership. In the '60s, he led sit-ins at LeMoyne College. He was class president his freshman, sophomore, and junior years, and he was student body president his senior year. He was highly intelligent and was poised to do a lot. Also, I look exactly like him! From my mother, I got … intelligence, as well, but also sensitivity. To a fault, she always goes above and beyond to help people — even to the point of taking her "last" and giving it to another. I give more of my time away than I should, but I'd rather look back and see where I helped somebody, because I know that at certain intervals in my life, there were people who helped me when I needed help. The biggest challenge with civic involvement is … garnering consensus. Anything that involves dealing with people is challenging in the sense that individuals have their own opinions — and sometimes agendas. The challenge is creating some consensus among disparate ideas. Residential real estate … I never had a strong interest in residential even though it was the family business. I just didn't. Attending the majority-white Memphis University School taught me … that I'm just as smart and just as capable as anybody else — and that I could relate to people of all different backgrounds. That was the greatest benefit. From my grandfather, I learned … He was a leader, as well. A very quiet, philosophical man and a minister. When he spoke, you knew there would be meaning in what he was saying. One of the biggest things I got from him was dedication to family. When my grandfather was my age, he had six children and a wife who didn't work. He put all of them through private school, through college, helped support us, and then even after his kids were grown, he still helped them out. He mentored a lot of people and was very involved in the community — politically and civically. As a child, I dreamed I would be … I didn't know! I just knew I wanted to be important, to be somebody. I always tell young people … Imagine yourself at the next stage of your life. When I was in elementary school, for instance, I imagined myself in high school. How do I want to be? What does that look like? As a young man, I imagined myself as a husband and father. That type of continuous thought process has always given me an ambition to accomplish and be better tomorrow than I am today. At Memphis University School, I saw … an opposite experience of when I went to public school. Out of 1,500 students, five of us were black. I realized there are some wealthy people in this city with some serious privilege. My classmates would automatically get a new car at age 15; they'd vacation in Destin and Vail. They'd ask me, "Where are you going for spring break?" I'd say, "I think I'll be at the house hanging out with my grandmother!" My teachers always saw me … as the ringleader. If kids acted up in class, the teachers would say, "Darrell, the only reason they're doing it is because you're doing it." I thought maybe it was just because I was bigger than everybody. A good example of my perseverance … I had to catch the city bus from my grandparents' house to go to Memphis University School. I'd be at the bus stop at 5:30 a.m., ride Downtown, and transfer to another bus that took us out east to the school by 8 a.m. I'd go through the school day, go through football practice, get back on the bus at 6, go back Downtown, transfer to a bus that took us to my uncle's house — the bus that could take us to directly to our grandparents' house stopped running at an earlier time — wait for my grandparents to pick us up, and we'd get home about 8 o'clock. Then we had to do it all over again the next day, every day. I kept thinking, "OK, I'm going through all of this when most guys live right around the corner from the school." I'm not easily … upset. But when I see intentional, deliberate unfairness, I do get upset. One personal trait I'd like to change … procrastination. I'll think about something 10 times before I actually get to it. What drives my civic and political involvement is … During my Rhodes days, I became very interested in the spreading of cultures and understanding how people make sense of the world. Anthropology taught me that there are different norms and values across the spectrum of how people consider their respective existences. The sociology aspect of looking at the world through a social context is something that, to this day, I can't escape. I view everything through a social lens. That's what drives my involvement, in terms of trying to address those things that are jumping out at me as issues that need to be impacted. And being involved is the only way that things get better. I applied to be in Leadership Memphis … in 1999. I was only in my 20s, but I got accepted. So there I am with the city treasurer, senior vice president of Union Planters Bank, president of the Junior League — all these community leaders. It taught me that our community is in constant need of leadership at varying levels, and there are channels and avenues for all of us to apply some level of leadership in making Memphis better. In school, I used to get in trouble for … laughing so loudly. I almost got off track … during my MUS years. My motivation and drive waned. I missed some days of school just because I didn't feel like going. It had gotten to a point where it was occurring too frequently. One of my football coaches pulled me to the side and said, "Man, you need to get it together. Let me tell you something: If you graduate from this school, you'll be able to do anything you want to do in this city." I knew it to be the truth. I straightened up and got back with the program. My least favorite subjects in high school … were math and science. I was adequate enough to pass, but I wasn't too interested in them. In real estate, if you can multiply, divide, add, and subtract, you've got it. It doesn't get much more complicated than that! Wine or beer? … Wine. And I get teased about it, too! Buttery chardonnay. Sports taught me … not to quit — no matter what, no matter how bad it seems. You can't give up on a play; you can't give up on your team. When you play sports, you develop a mental toughness to where you're harnessing your personal motivation and power to impact something. I met my wife … in 1994 at LeMoyne-Owen. During my junior year at Rhodes, I might as well not have been in school. That year, my GPA was probably 0.3. When I came back for my senior year at Rhodes, the financial aid guy said, "Darrell, you don't have enough hours to qualify because of this bad year you had. You need to go somewhere, get your hours back up, and then come back." I thought, Man! I'm not going to graduate with my friends! I'm off track now; I screwed up. But I had to own up to it. I created the mess, and I had to clean it up. So I went to LeMoyne-Owen College, where I met Mikki. She sat in front of me in English class. One day, her purse was sitting on the floor. I wrote my number on a piece of paper and dropped it in her purse. She never called! A few months later, we started talking at a party. This time, I used one of my old tricks. I told her to tell me her telephone number, and I would memorize it and call her the next day — which I thought that was kind of impressive. She gave it to me and then left — and I quickly wrote it down! That was Feb. 4, 1995. My son, Brooks … is named after my paternal grandmother's maiden name. He's two and a half now. The first time I held him, I felt … it's almost indescribable. I felt powerful and in control of the world. I had been handed a gift that I wanted to take care of and be a great father to him. I decided to get my master's degree … in 2005 while working at Commercial Advisors LLC. Working in commercial real estate, you're often working with high-level corporate and business players. I was working on multi-million dollar deals, and I had not had one accounting class, one finance class. I at least needed to know how my clients' minds were working if I was going to properly advise them and help them out. I never realized that working full time and going to school at the same time could be so challenging! Most people don't know that I … never learned to swim. 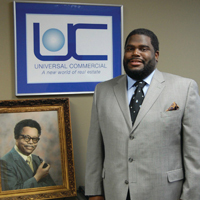 I named my business Universal Commercial Real Estate because … Universal Life Insurance Company was such an institution in the 1920s through the 1990s, especially in the black business community. They provided services — business and philanthropic — to those who couldn't get those services elsewhere. Universal was the FedEx of black business here at the time. I thought maybe my company could make that name mean something again. One of my early challenges … was that I started my business several months before the financial meltdown of 2008. My timing is incredible. I've always told people, "If I'm making moves, know that some calamity is coming!" As the youngest-ever chair of the Memphis Light, Gas & Water Board of Commissioners … I was 36 when Mayor Herenton appointed me to the board in 2009. I quickly learned that even though I may occupy the leader's seat, I had to be strategic about what areas I wanted to impact. I had to prioritize. I could not impact every area where I saw some need or some issue. Instead, I had to pick my best spot for getting the ball through the hoop. The trick to managing people older than you … humility, respect, and cooperation, but still be responsible as the leader. When I'm not being a business owner, I like to … spend time with my wife and son at the Levitt Shell and enjoy the arts —Memphis Symphony Orchestra, Brooks Museum, the Dixon, Ballet Memphis. Surprisingly, I'm not a sports fanatic. I enjoy a good game, but that's about it. Items still on my Bucket List … I guess I need to create one! My final 2 cents … is a favorite quote of mine from Dr. Martin Luther King Jr. that captures the way I try to live my life. "The ultimate measure of a man is not where he stands in moments of comfort and convenience, but where he stands at times of challenge and controversy." You find out a lot about yourself and the people around you when the chips are down, and you really find out what you're made of. When I look at Memphis, I see us in a time of challenge and controversy. I feel we each have to assess what our measure is as Memphians. Do we sit on the sidelines and complain? Or do we get in the mix and be a part of the solution in whatever way we can individually? We will find out a lot about our community during this time.